Smartphone battery draining problem could be one the worst things about it, especially if you are one of those who needs to use the phone 24 hours per day as a part of their daily life routine or for a business, like managing social media pages and accounts or to communicate with your team, etc. With better smartphones’specifications the more power required to work properly, your phone may only work for 8 to 10 hours which may force you to have a power bank to keep it alive for the longest time. Thus, knowing how to save battery on your Android phone is vital. In this article, I’m going to provide you with the 8 best battery saver Apps for Android to save some money instead of purchasing a power bank or an extra battery. 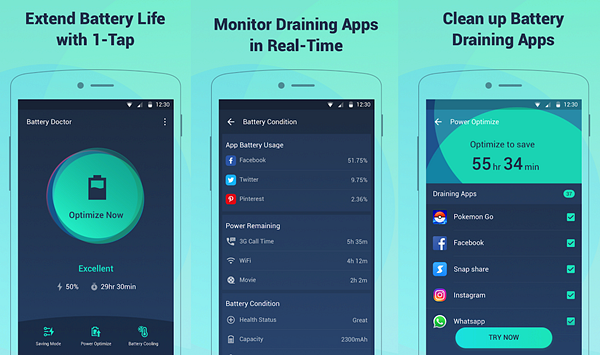 Let’s start the list of the best battery saver apps with one of the most common applications in this field which is known as DU Battery Saver. DU Battery Saver provides you with many functions that help you to monitor your phone’s battery and improve your phone’s performance like One-Tap Battery Saver, Junk Cleaner, Phone cooler, Battery Saver Widget for one-click optimization, and Super Long Standby Mode that allows you to have your phone on for the longest time possible. 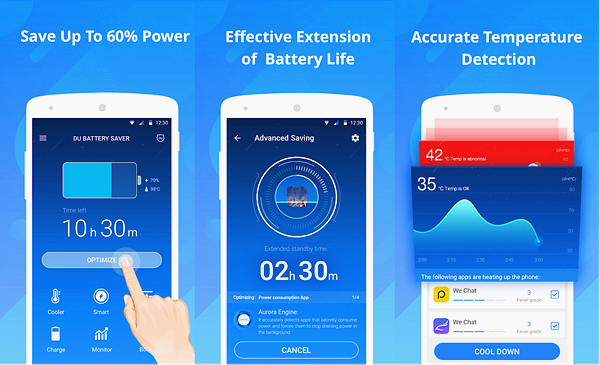 DU Battery also has some other functions related to the security like APP Protection and Wi-Fi Security Inspection and more. 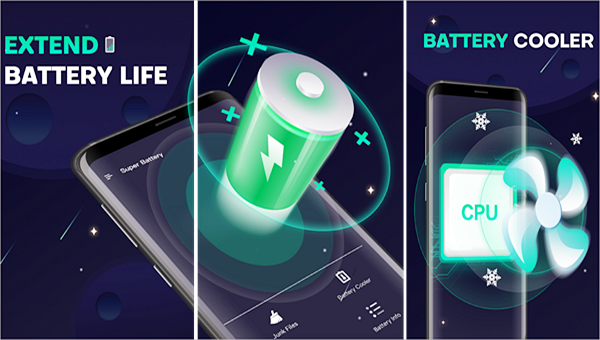 Battery Doctor is a free battery saver application specialized on saving your battery and keep it healthy made by the famous Cheetah Mobile Inc. that has developed Clean Master application. Battery Doctor estimates remaining battery time accurately with 3 stage charging system that provides you with a professional charging experience to extend your battery life. It also gives you toggles to control Wi-Fi, data connection and Bluetooth easily with a CPU Management function to speed app your phone with a push of a button. Power Battery gives you a full and completed package of saving your battery more than any other battery saver app could offer. You can optimize your apps that cause battery draining, and know exactly how much time remaining before the phone turns off. Power Battery also has some specific features for the phones with Fast Charging feature like stopping battery draining apps while charging, showing battery percentage on the screen along with the charge time remaining, Speed Mode that allows you to fast charge the battery when it’s below 80%, and a great function called Trickle Mode helps you increase your battery life by reducing the charging input when battery is 100%. 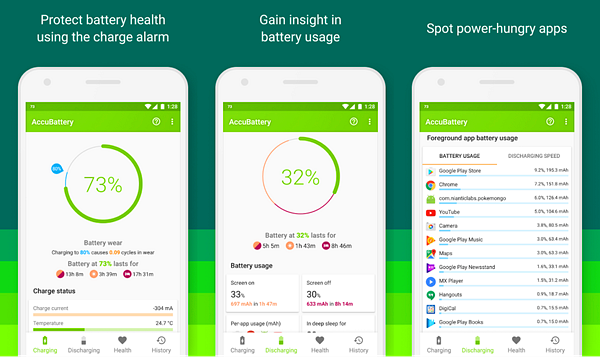 You can also use the Android battery saver to identify the applications that have the highest power consumption rate to remove or stop them when you need to extend battery life by yourself. 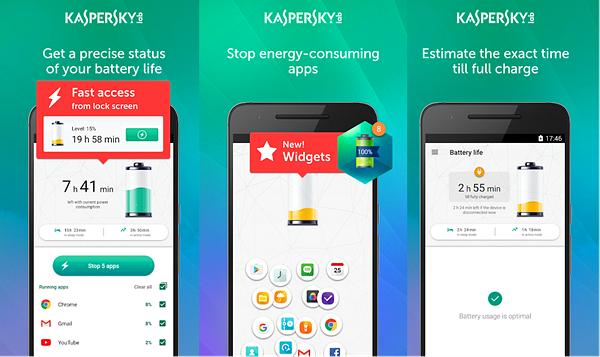 Kaspersky has decided to join the fight of battery saver apps on Android with its own application that provides you a lot of information about your battery like the remaining time for your battery to work and the estimated exact time till full charge. Along with the battery saving functions like closing energy-consuming applications and excluding your favourite applications from being terminated when you extend your battery life. 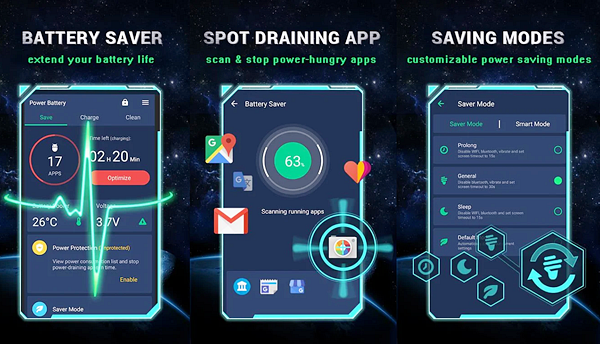 Also, Avast has decided to join the game with its own Battery saver app that allows you to stop all the hungry apps with a click on Stop Apps button, know how much life you have left in your battery, activate pre-configured profiles to optimize your phone’s and battery’s performance. 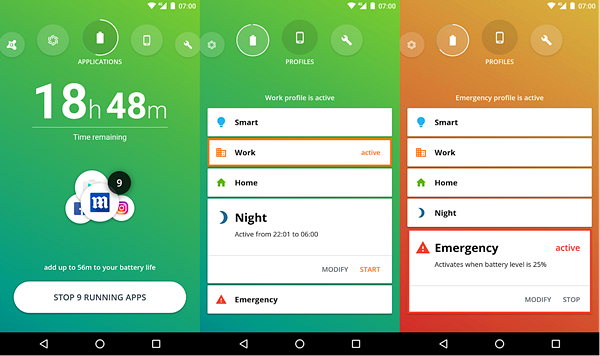 The application also gives you an adaptive Smart profile to let it adjust your phone’s settings to extend the battery life based on your regular usage. 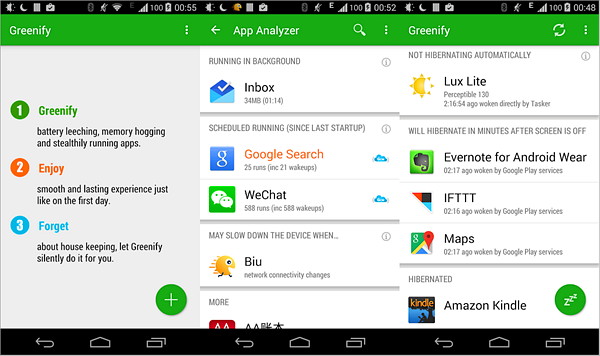 Greenify is considered to be one of the must-have root applications as it provides you with a huge number of options to extend your battery life like shutting down hungry applications with no background running services which guarantees not consuming battery or data, the ability to mute applications’ notifications, and an analyzer to show you how much each app consumes. Another great application in our list of the best battery saver and booster apps for Android that helps you monitor and extend your battery by many means including speeding up your charging time with no overheating problems, optimizing your battery by closing the hungry and high battery consuming applications, statistics about your battery including battery percentage, remaining battery time, and more. The application also provides some other features like Junk Cleaner that helps you free up some space for other apps and to increase the performance of your phone, and a Private Browser feature for safe browsing experience. In my opinion, AccuBattery has the best and most simple interface between all the other battery saver apps for Android, and it’s not just the interface, as it provides you with many battery saving functions like increasing charge speed by letting you know the best charger and USB cable for your devices, measuring the charging current (in mA), measuring real battery capacity (in mAh), and gives you an ongoing notification for real-time battery statistics at a glance. Those were the 8 best battery saver apps for Android to extend your battery life and performance. If those applications didn’t work and you have decided to replace your whole mobile phone with a newer one. 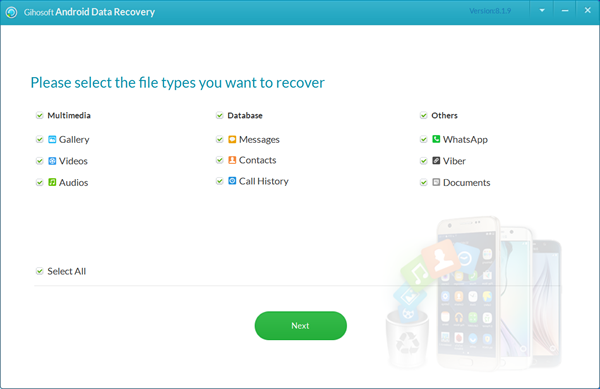 By the way, don’t forget to use Gihosoft’s free Android data recovery software if you accidentally deleted or lost some important data on your phone, which can easily solve any data loss problems you encounter.